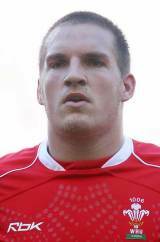 Wales and British & Irish Lions prop Gethin Jenkins is regarded as one of the best loose-head operators in world rugby and is currently turning out for Top 14 side Toulon. After playing regional rugby, he was a fixture of Wales' 2003 World Cup squad, featuring in every game. Come the 2005 Six Nations, he started every game for Wales and scored the first try of the Grand Slam clinching win over Ireland at the Millennium Stadium. His superb form during the tournament led to three caps on the 2005 British Lions tour to New Zealand, although he could not repeat his success on tour in a pack that was going backwards. Injury and a loss of form blighted Jenkins' 2005-6 season, as he struggled to find form for his club Cardiff Blues and to force his way into the Wales reckoning but he had improved come the 2006-07 season. Selection for his second World Cup in 2007 was ensured with some strong end of season performances for Cardiff and impressive performances for Wales the previous season, and Jenkins went on to start three of Wales' four games at the finals, including the key clashes with Australia and Fiji. Following the World Cup Jenkins was handed the Wales captaincy for the first time for the first match against South Africa. Under new Wales coach Warren Gatland Jenkins won his second Grand Slam after fighting his way back into the team following appearances as a replacement against England and Scotland. Selected for the 2009 Lions tour of South Africa and made the XV for the opening two Tests. After playing the whole match in the first Test defeat in Durban he had to go off with a cracked cheekbone in the second half of the second Test after a collision with Bryan Habana. And going into the 2011 World Cup - Jenkins was a doubt having had a 2010-11 season ravaged with injury. But he made the tournament and upon Jenkins' return to his side the Cardiff Blues, his signature was hotly sought after with Bath, Perpignan and Toulon all chasing a deal for the prop. But on February 21, Jenkins confirmed that he would journey cross-Channel and play for Toulon. In 2012, he joined the pantheon of Welsh greats by winning a third Grand Slam. Victory over France in Cardiff ensured a place alongside Gareth Edwards, Gerald Davies and JPR Williams as the players to achieve the feat. Come the 2012-13 season, Jenkins had departed the Blues for Toulon and was packing down alongside the likes of Andrew Sheridan, Bakkies Botha and Carl Hayman. Despite playing in the Top 14 and not back in Wales, Jenkins was still keen on representing the international side. Jenkins continued to play a central role for Wales as they overcame a poor run of results to retain the Six Nations championship. And despite not being first-choice for Toulon, Jenkins was named in the Lions squad to tour Australia.